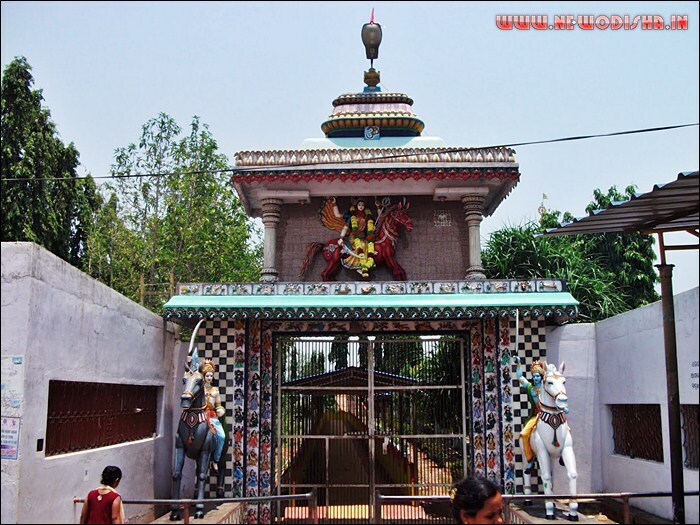 Siddha Bhairavi Temple is one of the famous Shaktipitha of Ganjam Dist. is situated at remote village Mantridi near Berhampur. The temple is named after Goddess Bhairavi, the incarnation of Goddess Parvati. The icon of the deity is having one leg and four hands craved in unfinished fashion. The temple was built in the year 1937 AD. Many saints has got Siddhi (salvation) here by worshipping the Goddess. So the pitha is known as Siddi Pitha. It is alleged that Goddess Bhairavi was worshiped by the Panchu Pandavas in Dwapara Yuga. Gajapati King Shri Purusottam Dev also worshipped goddess during Kanchi Expedition in 15th Century AD. This Pitha of Goddess is originated because of corpus of Sati Parvati , who sacrificed herself in the Jagyan of Dakshya Prajapati. The legends also say that Fisherman and Sailors pay worship to the goddess before the commencement of their journey. The goddess is also known as the prime deity of Sadhabas. The 35 feet high temple of Goddess Bhairavi is the main attraction of the place, which is surrounded with three funeral sites at the outskirt of its nearby villages. Ancient art and culture of Odisha can be viewed in the walls of the temple. The sculpture of the deity is situated 4 feet down the ground level. The deity has four hands and one leg, perhaps named as ‘Ek Pada Bhairavi’. The deity has been worshipped by a special kind of professional worshippers named as Malee. The presence of sky high Kerandimala Mountains adds to the scenic beauty of the place. The other side of the mountain one can found the age old famous Ganesh Pitha named as Panchama. There is a beautiful garden with decent flowers just at the entrance of the Temple Gate. The presence of 84 feet Jagannath Temple along side the main temple enhances the spiritual beauty of the place. The Temple House (Usa-Kothi) consisting of 108 sub shrines dedicated to all Hindu Gods including 12 Jyotirlingas and Nagagraha is another valuable attraction of the place. 0ne can reach the place both by bus and train. Berhampur Railway Station is the nearest railway station. It is about 18 Km away from the Temple. Bus and Taxi facilities are available from Berhampur to Mantridi. As the temple is on the side of NH-5, so it is not difficult to reach the place. The place Bhairavi is so close to Odisha-Andhra border. Dist. Head Quarter of Ganjam is 40 Kms and Bhubaneswar is 195 Kms. Away from Bhairabi. Give Responses for "Siddha Bhairavi of Ganjam District"